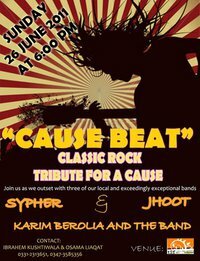 A tribute to classic rock, featuring three of Karachi's best underground bands. Jhoot , Sypher & Karim Berolia. Throughout the evening the bands will be belting out real old school rock before music died in the year 2000! We will also be given brief glimpses of local rock influences. Join us as we outset with these exceedingly exceptional bands.